One thing I know I need to do in order to be helpful here is to step back and get perspectival distance on the assumptions about teaching and writing I’ve built up over the past twelve years or so. So in my meeting, I listened a lot, asked questions, and took notes. After I went back to the office and typed up the notes, I opened two of the books I brought to help reset my assumptions to zero: Katherine Gottschalk and Keith Hjortshoj’s The Elements of Teaching Writing and Cheryl Glenn and Melissa Goldthwaite’s The St. Martin’s Guide to Teaching Writing. (I’ve re-read Erika Lindemann’s A Rhetoric for Writing Teachers too recently to be able to come to it with fresh eyes.) There’s much to commend both books, beginning with Glenn and Goldthwaite’s observation that “The first thing any new teacher must do is gather information” (3), perhaps glaring in its obviousness save that I’ve been working hard to do precisely that in an environment where I’m off-balance and uninformed, where I don’t know any of the ropes or routines. 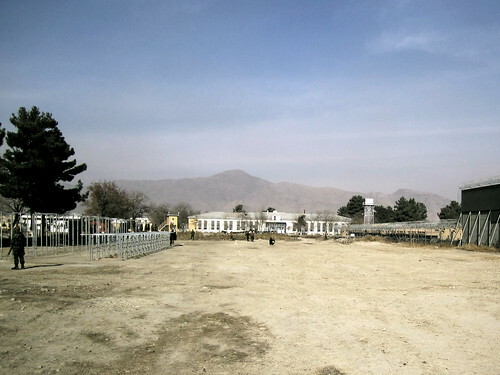 Certainly, I’ve been “mak[ing] inquiries about the academic level of the students [that the Afghan instructors here] will be teaching” (Glenn and Goldthwaite 4) and “[t]ry[ing] at this point to find out all [I] can about the backgrounds of the students [they] are likely to encounter. Until fairly recently, teachers of writing have treated all students as if they were very much alike, but that convenient fiction is no longer feasible to maintain” (Glenn and Goldthwaite 5). The second quotation is perhaps even more true in an institution drawing from a population incredibly diverse in terms of economic status, literacy and previous education, and language and tribal background — Uzbeks, Nuristanis, Pashtuns, Hazaras, Tajiks, and others. And I like the way Gottschalk and Hjortshoj begin, as well, by posing some fundamental questions: “What is wrong with student writing? … Who is responsible for improving student writing?” (4). Who ought to be able to teach writing (5), and “[w]hat is good writing” (7)? Gottschalk and Hjortshoj then move to big-picture concerns about writing and learning, about philosophies of teaching, and about course design (12-13): this seems smart to me, to orient oneself to the biggest and most important concepts, the overarching frame, before one starts to work on the details. I know which courses and which aspects of curriculum my Afghan counterpart wants the most help with, and I have a loose sense of what pedagogical areas he’d like me to help his faculty work on, but my sense is vague and limited, and it’ll take more time and talk — weeks, I think, at least — to refine and broaden and specify that sense. Glenn and Goldthwaite take a different approach, focused much less on the big-picture questions: while they devote pages early on to constructing a syllabus, it’s not so much about course design as it is about administrative requirements, which strikes me as odd, or at least as not an approach I would choose. They assert that “The first details you should find out about are the number of credit hours the course carries and the number of times the class meets each week” (Glenn and Goldthwaite 3) and ask, “Must students write and submit a certain number of essays? Must they keep journals or reading logs? Is there an official policy with regard to revisions? peer evaluation? teacher conferences? evaluation and grading? Is an exit exam required?” (4), which are all relevant and important questions, but not the things at the front of my mind as I first beging thinking through the design of a course. Similarly, they focus on the administrivia of teaching writing in their account of the first two days, enumerating “bureaucratic tasks,” syllabus review, introductions, dismissal, more “bureaucratic tasks,” and the clinically characterized “diagnostic” writing assignment. As I try to stand back from my assumptions and think about the Afghan students and instructors here, I still can’t help but say: this isn’t how I would want to start thinking about a course, and it isn’t how I would want to start teaching a course. Certainly, the administrivia are necessary, elements of a sort of logistical scaffolding that makes other things possible, forms of enabling the work-behind-the-work that does deserve to be at times foregrounded upon, reflected upon (“How do you write? Where are you when you write? For how long at a stretch? What do you need to know or do in order to be able to write? What are the non-writing tasks that make you able to write?”), but it’s not an end in itself, and not something that one should lead with. “Welcome,” I say. “This is a writing class. I believe you can write, and that you can write well. I know that you learn by doing, and this class will be in doing writing, in engaging the process, and in learning and practicing how to internalize the habits that will make you a better writer. So we’re going to start by doing today: I’m going to ask you to write. 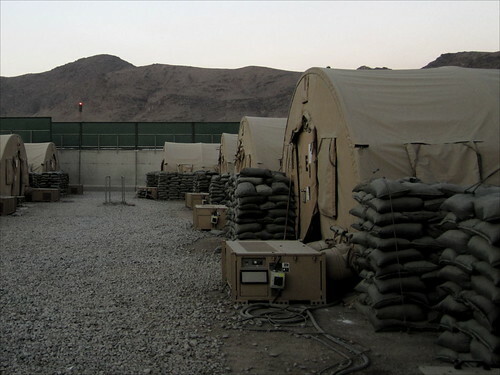 I’m on a military base in Kabul, Afghanistan, mostly set up in the small (9 feet wide by 23 feet long) barracks room where I’ll live until June. It took some doing getting here. 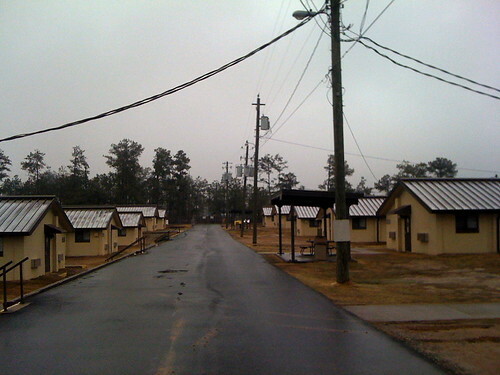 I left our home in Highland Falls, New York, early in the morning on 8 January 2011, and showed up at the CONUS Replacement Center at Fort Benning, Georgia later that day. I’ll be necessarily vague on some of the details that took me from there to here, but after a number of days I traveled from Fort Benning and spent some hours in the air before setting down in Europe to refuel, and then a few more hours to an airbase in the Middle East that serves as sort of a gateway to various destinations in that part of the world, broadly considered. That was where I last posted from; that dusty place with the enormous wide-open sky, assembled semi-permanently in the desert out of concrete pads and hundreds of tents and various tan-colored trailers and shipping containers and generators and half-shells and diesel-powered floodlights and highway barriers, populated by transient soldiers and civilians and contractors and maintained mostly by people from other poorer parts of the world. Lots of waiting and checking monitors and standing in lines. I expected to be there longer than I was, but there was a flight unexpectedly added, a military plane, and we sat facing center on either side of the cargo bay, hoping that the chains that held down the large armored vehicles between us would hold tightly enough on takeoff and landing. From there, another few hours in the air to land in the cold dark early hours of the morning at another airbase, one far less well-equipped to deal with travelers in significant number than the previous installation, where no one seemed to know anything about the various forms of transportation that might be able to take us from there to here. The flights were full, with nothing projected for days, and with the weight we were carrying, rotary-wing wasn’t an option, and so it took a number of phone calls and emails — a remarkably difficult proposition, with inoperative cell phones and mostly unavailable internet — to get us linked up with an officer who was eventually able to find a place for us in an overland armored convoy. (Part of the solution came from me calling home on the free phones at the USO coffee shop and asking the Orientalist to send an email from Highland Falls describing my situation to a member of the unit waiting for us in Kabul.) For that leg of the trip, I got up first at 4 o’clock in the morning to see if I could get on one flight, but couldn’t, and then there were two more toward mid-day, and then finally the surprise flight was announced mid-afternoon, which meant by the time that I found out I was getting on the convoy, I’d had about four hours of sleep and been awake for thirty hours. 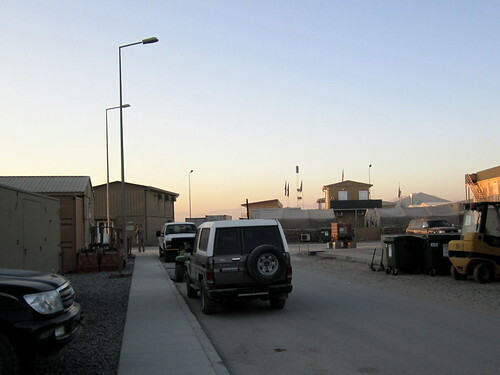 The convoy was the first event that opened my eyes to what I’ve signed up for, at least in terms of the day-to-day exigencies of life for Americans in Afghanistan. I won’t miss Fort Benning. 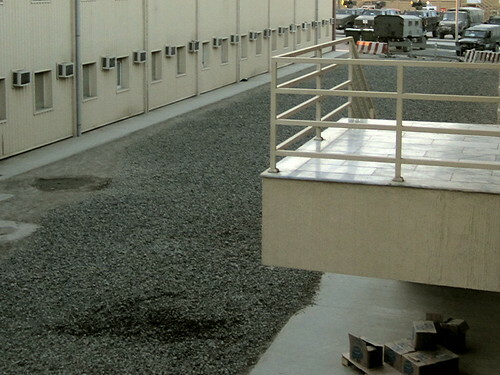 The soldiers of Alpha Company, CONUS Replacement Center made the best of a challenging job, and in doing so were professional and extraordinarily helpful. The civilians and contractors working the various clearance points were sometimes less so, interested more in what they were having for lunch than in rendering assistance; clerks rather than professionals whose definition of service was limited to getting your name off their lists. 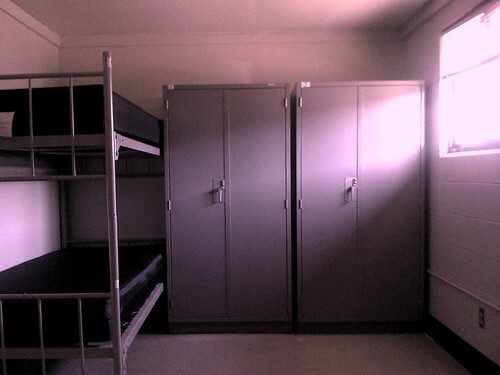 My initial impulse would have been to characterize the accomodations at the CRC as spartan. That would have been inadequate, and that impulse reminds me how much I’ve forgotten of my time in the Army.